Are you smarter than a baboon? 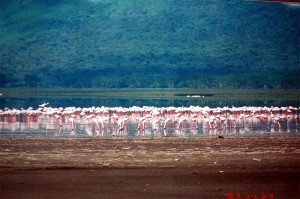 At first glance Lake Nakuru National Park in Kenya is a peaceful beautiful safari park. It’s best known for the thousands and sometimes millions of flamingos. Recently the park was enlarged so it could provide sanctuary for more than 25 black rhinos. Overlooking Lake Nakuru is a picnic area called Baboon Cliff. Aptly named because of the troops of baboons that live here. When I visited Lake Nakuru I had lunch at Baboon Cliff, prior to entering the picnic area my team was briefed to be “on guard” because the baboons were very bold here. However, there was no amount of briefing that could have prepared us for what was about to happen. It had been quite a morning seeing rhinos, hippos, vultures, lots of zebras and even hyenas up close and sometimes personal for the very first time. As we settled into the picnic area, within seconds, we were surrounded by about 25-30 baboons. Our guides had large sticks and were doing all they could to keep the baboons at bay. And that job quickly became increasingly more difficult. Baboons are really crafty characters and worked together to distract us so the larger more aggressive ones could try to rob us of our food. They would come together almost like a football team in a huddle, make disturbing sounds as if they were formulating a plan. Then, one or two would come in close and do some kind of trick, or something entertaining while the aggressors would try to charge us. And it’s all fun and games, until you are face to face with one of these scary creatures. Taking note of my anxiety, Mike, one of the men on our team, invited me to sit on a bench with him, promising to fend off any baboons that got close. So I acquiesced and agreed to sit with him, but against my better judgement. As we opened our box lunch and started to go through it, a huddle formed just about 25 yards away from us. We had our eye on that huddle and then they dispersed. We all breathed a sigh of relief. Then out of nowhere a baby baboon appeared before us doing tricks, making sounds and before we knew it all of us were paying close attention to the baby. When out of nowhere, the biggest baboon I’d ever seen was on top of Mike, wrestling him for his food and mine. In a matter of seconds, Mike was on his back, with the large creature on top of him. Everyone sprung into action, even the other baboons. Needless to say, the big baboon got away with Mike’s lunch and mine. And as quickly as he’d been able to spring into action, he was off and running with the bounty of his efforts. He proudly joined the huddle and shared the spoils with the rest of his troop…or should I say team? So, what does this have to do with community and marketing? What’s the lesson here? It’s the power of collaboration and working together to accomplish a goal. It’s so amazing that the troop of baboons knew that unless they worked together, there was no way they would have been able to get a single morsel. It’s the same in our communities, organizations and even friends. As organizations find themselves running very lean, collaboration is critical to overcome the challenges of today’s competitive landscape. The social web has made it easier than ever to connect and collaborate to overcome any barriers that previously existed. If a tribe of baboons can grasp the power of collaboration and working together to achieve a common goal. How is it we lose site of it? This entry was posted in Chasing Goodness, Customer Journey, Journey, Life Lessons, Shine A Light, Story, Uncategorized and tagged Authentic, Authenticity, Baboon, Chris Brogan, Collaboration, Courageous, Determination, friend, Honest, Kenya, Project Authenticity, Transparent, Trust Agent, Trustworthy, Whisper. Bookmark the permalink.